The second in an occasional series for A level students which this time takes a very personal angle on the nature of literary study. Readers of Mister Pip will appreciate the transcendent power of literature: on a war torn Pacific island, the Victorian novel Great Expectations transforms a young girl. It’s a powerful illustration of how story crosses boundaries of gender, class, history and culture. Nonetheless, much recent, historicist criticism has seen Literature as very much a product of its own times, and has questioned such a universalist reading of Literature. It’s an approach to texts which is particularly popular at university level, and one which many of my own lecturers took; it sits easily with a materialist reading of history (and whilst I believe in the fundamental importance of material reality, contrary to rumour I am not a Marxist) and by those who particularly loathed a liberal humanist interpretation of Literature, I was taught to see how ‘universalism’ was an ideologically flawed concept. Shakespeare’s plays are thus posited very much in the times in which they are written. Measure for Measure is less about the universal need for grace, mercy and forgiveness than a representation of early Jacobean legal issues, attitudes to marriage or political concerns over the spread of Puritanism within the City of London. In a similar vein, Henry V needs to be read against a background of Elizabethan attempts to quell Ireland, whilst Macbeth must be read in relation to the accession of the Scottish James VI to the English throne. Others have emphasised the importance of gender, sexuality, race or class in our understanding of Literature. Without doubt, such readings of texts enrich our understanding of much that we study. But they do not tell the whole story and they certainly do not demonstrate an understanding of how our brains seem almost hardwired for story: from infancy, we revel in story, recognising its ability to help us understand our own place in the world, and it is in story that we frequently look for meaning, and we readily take different stories from around the world. Indeed, I want to go one stage further: to study Literature is to study the history of the human soul and our quest for meaning in this world. Whilst we might well disagree with Matthew Arnold – I am convinced that poetry will never save us – the study of literature is part of our spiritual quest as human beings. This is, of course, not to say that all Literature is explicitly religious or spiritual – in the same way that not all Literature is focused on the notion of love – and much literature is emphatically not Christian. Nor does such a reading give Literature a status on a par with the Bible – Christians see it quite differently, as divinely inspired and teaching revealed truth, none of which I would claim for Literature. But I do want to argue that even in its bleakest, most nihilistic moments, Literature is touching upon spiritual themes. Of course, much Literature of the past was explicitly spiritual in its outlook. To an extent, students are rapidly losing touch with this fact, in part because of the nature of changes to A level courses. John Milton (a local resident, in Chalfont St Giles) has all but disappeared from A level study and even from many university courses, partly on account of his difficulty as poet. Once regarded as important as Chaucer or even Shakespeare, the density of his verse, and the fact that it draws heavily on the realms of theology, the Bible and even classical allusion, means that it has often been dropped in favour of ‘relevant’ authors and those who are deemed more ‘accessible’ to students. So, too, with the Metaphysical poets of the early seventeenth century: few students these days have read of the spiritual travails of George Herbert or the dramatic conflicts of desire in John Donne, between his love of the flesh and his love for God – texts which, twenty years ago, were amongst the most commonly studied at A level. It’s hard not to view such a move as dumbing down or even part of a secularist agenda. Indeed, on a very basic level, English Literature is best understood in the light of a reading and thorough knowledge of the Bible. In many respects, however, even amongst some Christians, we live in a biblically illiterate age. In popular culture, how many are aware that the imagery of ‘Can you hear the distant drums?’ from Les Miserables draws on the Old Testament prophet Isaiah’s vision of swords being beaten into ploughshares? How many that John Steinbeck’s novel The Grapes of Wrath takes its title ultimately from the equally apocalyptic New Testament book of Revelation? Or that the poetry of William Blake’s Songs of Innocence and Experience draws on both books, particularly in its representation of ‘the lamb’? 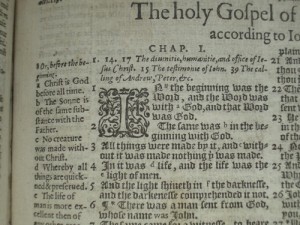 A spiritual reading of texts, however, is not limited to looking for biblical allusions: many of the earliest novels were in fact spiritual accounts, often with explicitly Christian themes, seen for example in the work of John Bunyan. For many today, Bunyan is an unfamiliar name though for over three hundred years his Pilgrim’s Progress was the most popular book in English after the Bible and few households would have been without a copy. The book has claims to being the first novel (for an excellent account of this period, I recommend Ian Watt’s The Rise of the Novel) and tells the story of Christian, who leaves the City of Destruction and makes a journey to the Heavenly City. Along the way, he faces many dangers, toils and snares, from the Slough of Despond (a bog, which symbolises periods of depression in the Christian believer’s life) to the Giant of Despair and the temptations of Vanity Fair. It is best understood as a Christian allegory but the novel also does something of a first in prose: the development and change of character is of paramount importance to Bunyan’s craft, a technique to be drawn upon by almost every subsequent novelist, including Jane Austen, E.M. Forster and Charles Dickens. Indeed, in my previous post on why we study literature, I mentioned the figure of Scrooge in A Christmas Carol and it is in this novel which I want to explore the importance of a spiritual reading of texts. Some read the novella as an indictment of early Victorian capitalism, emphasising Scrooge’s cruelty as an employer to Bob Cratchit, or the descriptions of poverty in Stave 2. A Christmas Carol, however, is best seen – beneath the guise of a Christmas ghost story – as an explicitly Christian parable. Scrooge himself – a short, bitter man – perhaps alludes to the figure of Zacchaeus, a tax collector who encounters Christ in Luke 19: 1-10, a parallel further developed by the ending of the novel when the repentant Scrooge not only changes in his approach to Cratchit but repays outstanding debts, makes charitable donations and enjoys feasting with his nephew and his wife. And the story itself is one of repentance: Scrooge is taken from a place of selfish loneliness to recognising his utter helplessness; when faced with the reality of his life and actions, Scrooge’s pride is stripped away, and he begs for the chance to start anew. The new found joy he experiences on Christmas morning is placed by Dickens in an explicitly Christian framework: Scrooge awakes to the ringing of church bells; he attends church worship; and his reformed character echoes stories of Christian conversion, with its emphasis on lightness of spirit (Scrooge is even described as being ‘as giddy as a drunken man’, which I would contend is an allusion to Acts 2!). Similarly, Great Expectations is best not understood as a story of love or desire. Whilst it is true that Pip is driven by a formative encounter with the beauty of Estella, this plotline in many ways is less about genuine love than a haunting sexual fixation; Pip never finds fulfilment in his love for Estella. Perhaps more important is the way in which the novel parallels the parable of the prodigal son (Luke 15: 11-32). Just as the prodigal son squanders his inheritance on prostitutes and wild living, so Dickens presents Pip in a similar manner: Pip visits seedy establishments in Covent Garden, accrues debts and behaves in a debauched manner with the Finches of the Grove, in effect a drinking club. Like the prodigal, he fails miserably, is left ill by his experiences and Joe – in the words of Pip ‘a gentle Christian man’ and in effect a surrogate father – rescues Pip from the iniquity of London. Indeed, the novel ends with Pip living a reformed, honest life of hard work – very much a Christian understanding. Although many other novels cannot be read in such explicitly Christian terms, they do, however, touch upon themes which are of spiritual importance and this is unquestionably seen in much modern fiction. John Fowles’ The French Lieutenant’s Woman might well reject Christianity but its concerns are of a spiritual nature: whilst conventional religion is mocked through the presentation of characters such as Mrs Poulteney, Charles’s questioning is fundamentally of a spiritual nature as he seeks to find meaning to his life. Ian McEwan, too, describes himself as an atheist and yet writes a novel titled Atonement, a concept at the core both of Judaism and Christianity. Whilst atonement never really is found for the wrongs of the past, a reading which ignores the spiritual element surely fails to grasp McEwan’s purpose, even if it is at variance with Christianity. Similarly, The Kite Runner is written from a broadly Islamic perspective, and yet is in effect seeking some form of atonement: Amir, the narrator, is arguably seeking to atone for his unjust actions towards Hassan. So, too, with drama – Tennessee Williams might well reject Christianity but The Glass Menagerie touches upon spiritual themes. The tragedy of the play is not just Laura’s lack of love, Tom’s unfulfilled ambitions or his mother’s overbearing meddling in her children’s lives; rather, it is the utter hopelessness which pervades the text. Symbols of hope and beauty and life are gradually destroyed; the delicate glass menagerie itself is shattered in a fit of rage. The language has suddenly shifted from the colloquialisms of the first three stanzas. ‘High Windows’ suggests again a church setting, and ‘high’ something beyond the mundane or the quagmire of human existence. Yet the final line remains characteristically ambiguous: certainty evades but the notion of ‘endless’ immediately suggests the eternal. Of course, Larkin’s conclusion is very far from those reached by T.S. Eliot or George Herbert, who both agonise over doubt and disbelief and wrestle with temptation but reach a state of acceptance and faith – as Andrew Marvell says ‘Had we but world and time enough’, this post might be much longer. But let me conclude: this, then, is what intrigues me about Literature, more than anything else: its touching upon the deepest questions in human existence. Some writers reject conventional belief; others wrestle and doubt; still others find faith. Which is for us as readers – who read to know we are not alone – a consolation and a challenge. For more information on the relationship between the Bible and English Literature, visit crossref-it.info.